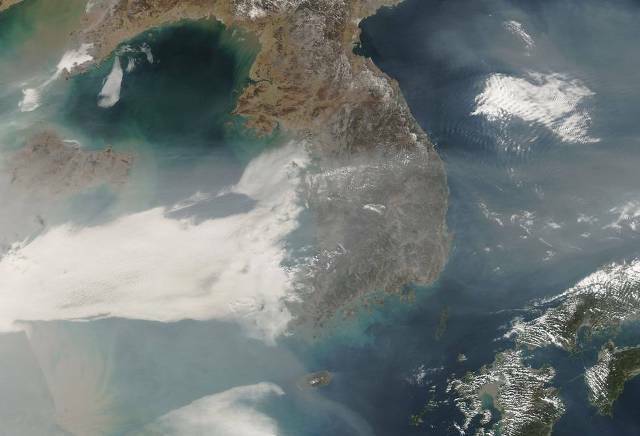 NASA and the Republic of Korea are developing plans for a cooperative field study of air quality in May and June to advance the ability to monitor air pollution accurately from space. The Korea U.S.-Air Quality study (KORUS-AQ) will assess air quality across urban, rural and coastal areas of South Korea using the combined observations of aircraft, ground sites, ships and satellites. Findings will play a critical role in the development of observing systems of ground and space-based sensors and computer models to provide improved air quality assessments for decision makers. Air quality is a significant environmental concern in the United States and around the world. Scientists are trying to untangle the different contributors to air quality, including local emissions from human activities, pollution from far away, and natural sources such as seasonal fires and wind-blown dust. South Korea’s capital, Seoul, is one of the globe’s five most-populated metropolitan areas. Because of the country’s varied topography and its location close to both rapidly industrializing mainland China and the ocean, the impacts associated with the many factors controlling air quality are larger and often easier to measure over the Korean peninsula than elsewhere. “Working with our South Korean colleagues on KORUS-AQ, we will improve our understanding of the detailed factors controlling air quality, how the processes interact, and how they are changing over time,” Crawford said. In accordance with an agreement NASA recently completed with South Korea’s National Institute of Environmental Research, Korean scientists will collect KORUS-AQ observations on the ground and in the air with a King Air aircraft from Hanseo University in Seosan. To take data during the experiment, NASA will contribute a DC-8 flying laboratory from the agency’s Armstrong Flight Research Center in Edwards, California, and a Beechcraft UC-12B King Air from Langley. Five South Korean instruments will be part of the DC-8 payload and one NASA instrument will be onboard the Hanseo aircraft. NASA’s DC-8 will conduct eight-hour flights to make direct measurements of the atmosphere from altitudes up to 25,000 feet. The NASA King Air will fly overhead with remote-sensing instruments that simulate satellite observations. The Hanseo King Air will make direct atmospheric measurements focusing on areas less accessible to the larger DC-8. Scientists and air quality modelers from both countries will work together to plan the aircraft flights and analyze the measurements. South Korea maintains an extensive ground-based, continuous air-quality monitoring network of more than 300 sites. Almost half of the sites are in the Seoul area and just over 80 percent are in urban areas. South Korea will host NASA instruments at some of the monitoring sites that are being enhanced for KORUS-AQ. KORUS-AQ will benefit the development of a new a constellation of spaceborne science satellites and instruments expected to launch in the years 2018-2022 that will make air quality measurements over Asia, North America, Europe, and North Africa. South Korea’s Geostationary Environment Monitoring Spectrometer instrument will monitor long-term climate change and improve early warnings for major pollution events for the Korean peninsula and Asia-Pacific region. NASA’s Tropospheric Emissions: Monitoring of Pollution mission, an instrument that will fly as a hosted payload on a commercial communications satellite in geostationary orbit, will collect air pollution measurements over North America from Mexico City to Canada. ESA’s (European Space Agency’s) Sentinel-4 mission will take air quality measurements and monitor stratospheric ozone, solar radiation and climate variables over Europe and Northern Africa.